CLZ Comic Collector is THE way to organize your collection! For years my OCD gave me fits with my comic collecting. Trying to maintain excel spreadsheets, notebooks and/or box labels was a constant chore. Additionally, I was plagued by not knowing which comics I needed when I was at events and sales. Or worse yet, didn’t know which issues I already had – buying doubles and even triples of the same book. About 5 years ago I found the CLZ Comics app during a free app deal. Up to this point, I had tried several apps for tracking comics (and even tried to use some video cataloging apps) with little luck. 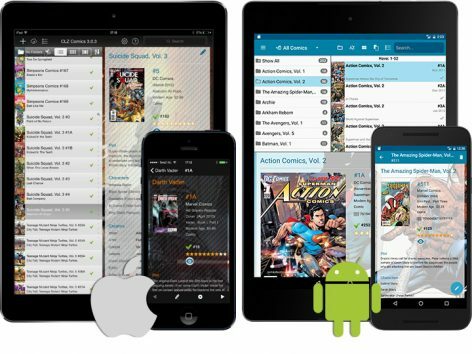 CLZ Comics (iOS, Android, PC, MacOS, Web – Collectorz.com/clz.com) is an all-encompassing and easy-to-use solution for my collecting needs. It’s also become my go-to app on my iPhone. Comic Collector desktop and mobile apps have basically the same feature set – store all types of information about your comics (covers, issue information, creator data, custom fields, etc). The entry of this information is probably the easiest if you have the mobile version which uses the camera to scan the barcode to search (the desktop version still has a search by barcode but you have to type it in). It will go out to their database and populate your entry with that information and cover. Takes very little time to enter boxes of comics (as long as the barcodes are on the front of the comics – a little longer when the barcodes are on the back and in a bag). Comic Collector includes a free cloud backup on their servers. This works two-fold: it allows for your data to be available on multiple devices and computers. Additionally, if the comics you’ve entered are not in their cloud it enters it in for the next person. The cloud also includes a web interface on Comic Collector Connect that allows you to view your collection if you don’t have your phone or desktop available. A nice touch. Are you wondering if there are any downsides to the software? They’ve had issues with their servers in the past few months which makes synchronizing a major pain – how ever, they’ve been transparent in their process to solve the problem and seem to have it licked. They roll out updates fairly often that fix bugs and add new features. If you are worried about it working after your subscription ends – worry not. I had no subscription for more than a year without a problem. And if you just need that major update – just pay the approx. $4 monthly charge once to catch up. You can try out all of the apps for free so there’s no pressure. If you do decide to take the plunge: the mobile apps are a one time purchase through the app store. The desktop applications require the purchase of a subscription (initial purchase of $69.95 comes with a 1-year subscription for updates). The month sub starts at $3.50 per month.